Paul Ryan is not a moderate, not a centrist, and certainly not a perfectly neutral non-ideological number-crunching budget wonk. He is a conservative whose fiscal blueprints and budgets are drawn up with conservative goals uppermost in mind. He’s a Reaganite pro-life hawkish supply-sider who wants limited government and the lowest possible tax burden. Out of all the running mates available, Mitt Romney chose one of the most explicitly ideological options. But moderates — and maybe, just maybe, the occasional liberal as well — should appreciate Ryan all the same, because he’s almost single-handedly responsible for saving the Republican Party from some of its own worst impulses. Failing political parties tend to develop toxic internal cultures, and the post-2008 Republican Party was no exception. Reeling from two consecutive electoral repudiations, Republicans looked poised to spend President Obama’s first term alternating between do-nothingism and delusion. They would demagogue every Democratic proposal, decline to offer any alternative on any issue, and seal themselves inside a fantasy world where tax cuts always pay for themselves and budgets can be balanced by cutting funding for NPR. Some of this came to pass. But from the earliest days of the Obama presidency, Ryan was pushing his fellow Republicans toward a different course. When conservatives praise the Wisconsin congressman for his courage, this willingness to ask more of his own party is a big part of what they have in mind. 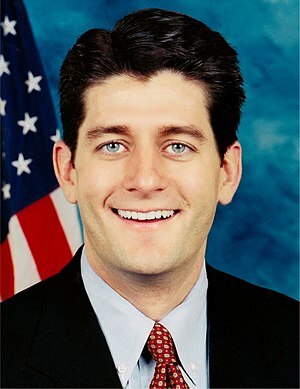 Briefly put, Paul Ryan might appeal to moderates, centrists and a few liberals because he is a serious man on a mission. His mission? To impose vicious and predatory, foolish and reactionary policies on a country that would be best served if it repudiated men like Ryan and, for that matter, Obama. Ryan adds gravitas to the GOP clown car, and for this he deserves praise. Douthat is also a reactionary, and it should surprise no one that he wants the Republican Party to take the lead in the imposition of political and economic reaction on the United States. It is also noteworthy that Douthat does not call for the political defeat of the Democratic Party. Both parties must share the burdens in the movement of the United States to the right.